Mathematics is very much fun subject and if one love logic then combination of math and logic will make you crazy. Here I am posting some of the logical brain teaser which use mathematics in its calculations. Each of the riddle listed below will test your logical and mathematical ability. These Math Puzzles are not very much tough. These are not very easy either. However each of these Maths Riddle is very much fun to solve. See how much you can solve it without looking at the answers. I will be posting the answers to these math questions soon. However please be free to post your answers in the comment section of this post. Q2. Following numbers form a Series. Some of the initial numbers and last number of the series is given. How many numbers are missing in this series? 2, 2.45,2.90, 3.35, ?, ? Then 31 x 34 x 12 = ? Q5. Following numbers form a Series. Check if 7108 will be part of this Series? 5, 10, 15, 20, 25 and so on. Then 15 - 10 = ? Then 9 x 7 = ? 1. Missing number puzzles with answers: In these Maths Puzzles you have to find the missing number which will replace the question mark in one of given square. 2. 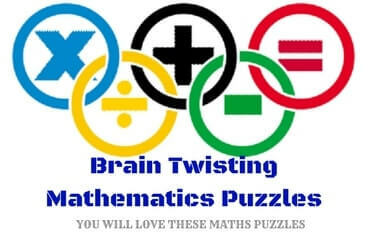 Maths Picture Puzzles with Answers: It contains Mathematical Picture Brain Puzzles in which your challenge is to find relationship between given 5 numbers and then solve it for the missing number. 3. Maths Logic Puzzles Brain Teasers with Answers: It contains Maths Equation Puzzles. These Maths equations are not correct Mathematically but these are correct Logically. Your challenge is to find this logical reasoning and then solve it for the missing number. 4. Quick Puzzle Riddles with answers for kids: After solving all these Maths Brain Teasers, its now time to solve some riddles. These are quick easy riddles which you will love to solve. Last equation, one need to watch it very carefully. Fan with three blades = 3. So with 2 blades = 2.